Stay on trails and respect the wildlife - you are in THEIR home! Skyline Trail is one of the most visited hikes in Mt. Rainier, partially because of its proximity to Paradise Inn and the highest point on the road in from Ashford, Washington. 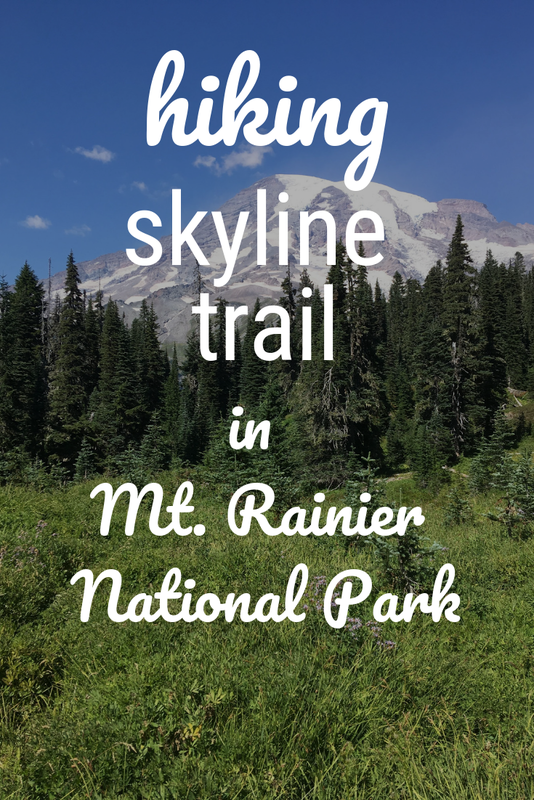 This hike is especially amazing when the sun is shining because you will be walking right next to Mount Rainier. · Make sure to wear hiking boots. When we were hiking, we saw a number of people trying to hike this strenuous hike in flip flops. I wouldn’t recommend this because once you get up to Panorama Point, it is possible there will be ice, snow and mud. · Be prepared for an elevation gain of 1,400 feet. This is a 5.4 mile round-trip hike, but it’s much more strenuous due to the gain in elevation. The top point, Panorama Point is 6,800 feet and you can see Mt. St. Helens, Mt. Adams, Mt. Rainier and the Nisqually Glacier. · Stay on the trails! There is delicate flora and fauna in this area and the only way to make sure it’s there for years to come is to preserve it. We hiked this clockwise from the parking lot, starting out on Dead Horse Creek Trail and splitting off to Skyline Trail when indicated. Hiking this way allows for you to see Mt. 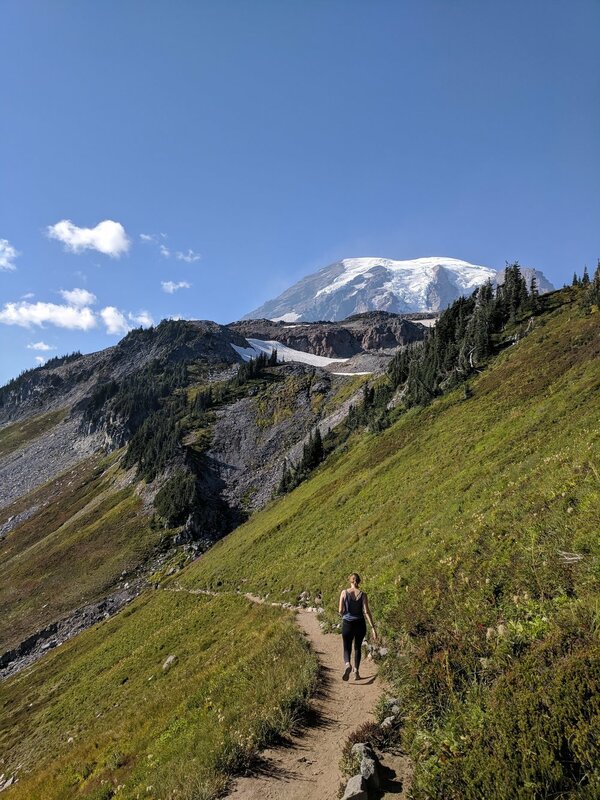 Rainier in all its glory (if it’s a sunny day), but note, the elevation gain is pretty immediate and you will be hiking straight up until you hit Glacier Vista. This is one of the best places to turn around if you are not interested or cannot continue hiking up. The trail for us seemed to thin out a bit at this point as we continued onto Panorama Point. This is also where we started seeing marmots, so be on the look-out! Once you get to Panorama Point, there is a restroom (if needed), which is the last respite for those hikers/climbers who are heading to Camp Muir. It’s also really awesome to see those who spent the last 2-3 days climbing to the summit! After this, you can start your descent and continue the loop, or take the shortcut on Golden Gate Trail, which we ended up doing due to time (this took a mile off the trip). You might also have to do this if the trail is too icy. This allowed us to walk through a gorgeous meadow. Eventually you will end up back to the Visitor Center and Paradise Inn. If you are hungry after this hike, there is a fantastic Tibetan restaurant called Wildberry on National Park Highway/706. The owner holds the world speed record on Mount Everest and also works as a mountain guide for Alpine Ascents International. While we were there the table next to us had just finished a practice climb/hike before they started their summit hike to Mt. Rainier the next day. Have you hiked the Skyline Trail? If so, what was your favorite part? Mine was definitely hiking so close to Mt. Rainier and seeing all the hikers descending from Camp Muir!